Amazon Flex, sometimes spelled Flexx, is the delivery service of Amazon.com. They hire independent contractors to delivery packages in their personal vehicles. 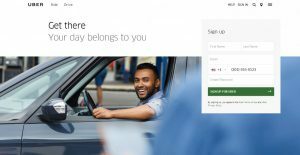 It works the same as ride sharing with Uber or Lyft, if you’re familiar with them. The entire system is run, tracked, and trained through an app. This is a win-win situation for Amazon.com and the delivery drivers. The pay, which I’ll get to later, is very generous, yet Amazon saves a ton of money on delivery expenses. I found a great review on YouTube that I posted below. It – along with the rest of my review – will give you a good idea of how it works and what you’ll be doing when you work for Amazon Flex. You set your availability. When blocks become available that match your availability, they show up in the app and you can choose if you want to accept them. They advertise $18-25 an hour, but I’ve seen it go as high as $31 an hour. On average, you’ll put 10-20 miles on your car per hour worked. At the time that this article was written, you got back 0.535 cents per mile for taxes in America. In my experience, that adds up to enough savings in taxes to cover 100% of your gas expenses and still have some left over to cover part of your taxes. It won’t be the same for everyone because not everyone gets the same gas mileage, but even with poor gas mileage, tax savings should be enough to cover gas expenses. Most of the deliveries are to houses that are on side streets so there’s barely any traffic. The space between houses can vary though. You might take deliveries that are across the street from each other and then take a few that are a few miles away. Most deliveries are 0.2-0.5 miles apart, but it’s not like that all the time. There will be times that you have to travel 15+ miles to get to the next stop, but that doesn’t happen too often. Most of time, they’re walking distance from each other. I used to drive Uber and Lyft as my side hustle before I found out about Amazon Flex. It’s better in so many ways. You know exactly how much money you’ll make before you start. I’d be out for hours and barely make anything with Uber or Lyft sometimes. Other times, I’d make a killing with Uber or Lyft, but I’d prefer to know what I’m going to make for the amount of time that I’m going to work ahead of time. The deliveries are grouped in the same area. You’ll only put 10-20 miles on your car per hour you work. With Uber and Lyft, I would sometimes put well over 50 miles on my car for every hour depending on where the passengers were headed. You will have to go out of your way sometimes, but you’re usually not all over the place. You don’t have to worry about unruly passengers or people vomiting in your vehicle. I never had any problems like those, but I’ve heard horror stories still the same. My daughter’s stepdad almost got in a fight with his passenger because the guy was drunk and wanted to fight for no reason. Yes, Uber deactivated the guy’s account after he reported it, but he still had to deal with it when it was happening. I was working as a salesman when I first learned of Amazon Flex. I delivered part-time for 3 months when I decided I wanted to do it full time so I’d have more control of when I worked. The money was so good that I could easily cover all my bills if I only got 32-35 hours per week. The problem was that it was impossible to know if I was going to get those hours because every Amazon Flex driver has access to the same pool of delivery blocks. They’ll take them before you get a chance if you’re not constantly checking what’s available. When I say “constantly,” I mean clicking the refresh button every 1 or 2 minutes until something pops up. And I’m not exaggerating at all. I mentioned earlier that I liked Amazon Flex better than Uber and Lyft because it’s less wear and tear on my car. This is true, but your car is still going to take a little beating with all the driving. It’s important to keep up on maintenance or you’ll be out of a job. Most packages are grouped close to each other when you accept a delivery block in the earlier part of the day. Later-day deliveries tend to be grouped farther apart because some of what you’re delivering are packages that were supposed to be delivered earlier but couldn’t for various reasons. The packages are on a rack when you get to the warehouse. The rack that you pull up next to is the area that you’ll be delivering to. If the area happens to be 5 miles away, you’ll be delivering 5 miles away. If it’s 35 miles away, you’ll be driving 35 miles just to get started. It’s all random. You won’t know until you step out the car and look at the labels. Dogs will protect the home. Most owners have enough sense to keep the dog in the house when they know they’re expecting a package, but now and then you run into an idiot who doesn’t think that far ahead. Be mindful of your surroundings, look for “Beware of Dog” signs, dog chains, foot prints, and other signs that a dog might live there and you’ll be okay. Even if you do all that, their bark is usually enough to scare the crap out of you even when you’re expecting it. It’s an annoyance that comes with all delivery jobs. Who is Amazon Flex For? How does Amazon Flex work? Delivery slots for Amazon Flex are called delivery BLOCKS. Delivery Blocks can be 2, 3, or 4 hours. Some blocks are reserved for you. Those blocks are only available to you. No one else can see them. You get a few hours before they’re released to the public. Some blocks are released to the public from the start. Those are first come, first serve. Once you accept a block, you’re responsible for it, but you can cancel up to 45 minutes before the block starts without being penalized. I’d recommend you try not to cancel at all once you’ve accepted a block. One hour before your blocks starts, you get a notification reminding you about it. You drive to the warehouse, scan yourself in, and start loading your car with the packages. If you work at a moderately quick pace, you’ll usually finish early, but you get paid the full amount even if you do. Sometimes they give you more than you can handle within the allotted time. It takes a little longer when that happens, but you don’t get any extra money for it. I think that’s fair since you don’t have to give any money back when you finish early, plus you finish early way more often than you finish late. The app is simple to use. It doesn’t take much training if you have any experience with the basic functions of a smart phone. The main thing you need to learn is how to handle different situations. 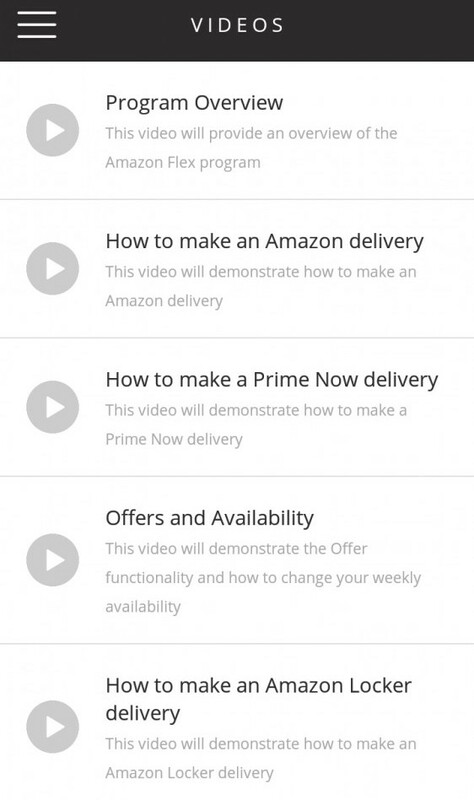 Amazon Flex has a library of videos that you can access thru the app that train you on all aspects of delivering packages on time, accurately, and safely. Each video is short, just 3-5 minutes long. There are 19 total. The support team is awesome. There’s never been a situation that they couldn’t fix within a couple minutes. 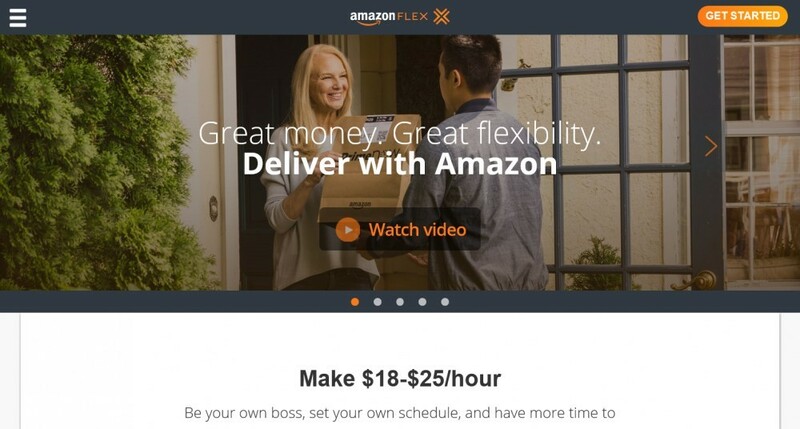 The pay for doing delivery for Amazon Flex varies depending on demand. The minimum pay is $18 an hour. 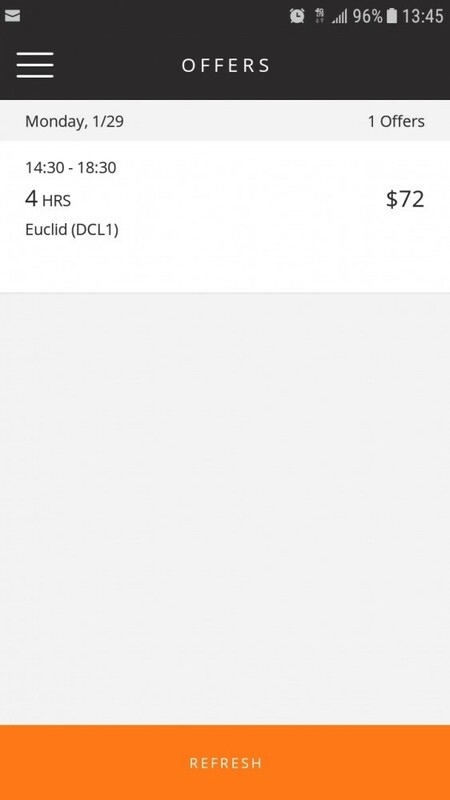 It gets as high as $31 an hour, but that only happens when Amazon has to entice people to get on the road, usually because of bad weather or somebody cancels at the last minute. I was impressed with Amazon Flex’s dedication to improvement. They had us fill out surveys at the end of shifts so they could get our opinions and find out about issues in the work area. What surprised me was that they didn’t just ask for feedback and not do anything with it like many companies do. They actually changed procedures and made updates to the app until problems were solved. Working for Amazon Flex became a better experience because of those changes (along with the great pay and relatively easy work). It’s a good way to make some extra money, but I would be looking to do something else while I was doing it if I were you. Like I said before, your car takes a beating and you’re always checking the app so you can accept blocks before somebody else beats you to it. Take a delivery job with Amazon Flex if you need to, but use some of what you earn to invest in something that you can do from home like I did. You can find my #1 recommendation below. Do you enjoy these reviews? Are you looking for Amazon Flex delivery jobs or already have one? I like to hear from my readers. Use the Comments field below to tell me what you think, and if you got any value from this review, please Share it. I think Amazon gets a bad rap because they cost people jobs by putting malls out of business, but they also create new jobs, as you mentioned. Amazon Flex helped me a lot with getting money to invest when I needed it. Thanks for commenting. I have heard about Amazon Flex but didn’t know much about how it all worked. Thanks for sharing the information as I now got an idea of what it’s all about. I think the Amazon Flex is a great idea and will bring much-needed employment for people searching for ways to earn extra money. Unfortunately, no, there is no referral program because Amazon Flex pays so much that there is a long line of people waiting to get in so there’s no need for them to offer incentives to join. The link to the site is at the top of the page. My only concern would be that there wouldn’t be an Amazon storage house near enough to me. I live in the greater NYC area which has a ridiculous number of people, but my area is actually pretty rural. Do they have a referral program like Uber and Lyft? Thanks for sharing this, I will need to bookmark your page for future reference. Do you have a link to a sign up? You can have a passenger as long there’s still enough room for all the packages and they don’t cause any delays. Thanks for commenting. I had never heard of amazon flex before reading this article (but I get so many deliveries from amazon that I have wondered about the people they use). This is great honest feedback and definitely sounds like a good way to make a little extra money. Do they have any rules about other people riding in the car with you or anything?